The Swami Vivekananda Cultural Centre, High Commission of India, Colombo will be presenting three well known Indian performing artistes, Tabla recital by Prof. Mukund Narayan Bhale on 13 December and Andhra Natyam by Chinmayi Arukula and her Guru Kala Ratna Sri Perini Kumar on 14 December at 6 p.m. at SVCC auditorium located at 16/2, Gregory’s Road, and Colombo 7. Prof. Mukund Narayan Bhale born and brought-up in a musical family at Gwalior has carved a niche of his own under rigorous training under Pandit Yashwant Rao Shirgaonkar and Pt. Gajanan Tadey. Receiving a gold medal in Master’s degree from Indira Kala Sangit Vishwavidyalaya, Khairagarh, Chhattisgarh, Prof. Bhale continues to serve at the same institute as a professor in Tabla and Head of the Percussion Department. He has been awarded with many titles such as Sangeet Kala Ratna, Taal Shiromani Sammaan, Nav Sadhana Kala Kendra Award, Brihan Maharashtra Kalakar award and many more. He has also been awarded the Senior Fellowship from Department of Culture, Government of India. He has accompanied a galaxy of eminent vocalist and instrumentalists like Pt. Kumar Gandharva, Pt. Hari Prasad Chaurasia, Pt. Vishwamohan Bhatt, Pt. Rajan and Sajan Mishra, Pt. Buddhadeo Das Gupta and many more and travelled to many countries abroad such as England, USA, Germany, Russia, France, Switzerland, Holland, Italy, Poland to name a few. He will be accompanied by eminent artistes from Sri Lanka. Andhra Natyam, originally called Lasya Nartana and practised only by temple dancers is a vibrant dance style originating from the state of Telangana. Chinmayi Arukala will be presenting Andhra Natyam with her Guru Kala Ratna Sri Perini Kumar showcasing Guru Shisya Parampara. Guru Kala Ratna Sri Perini Kumar is one of the first disciples of Kalaprapoorna Late Sri Dr. Nataraja Rama Krishna Guru deva, who was the pioneer of both Kuchipudi and Andhra Natyam. Perini Kumar has learnt the world-famous Perini Shivatandavam and has performed this popular danceform worldwide. Shri Perini Kumar have completed over 35 years of experience in the dance field and trained nearly 2,000 students on Andhra Natyam and Perini Natyam. 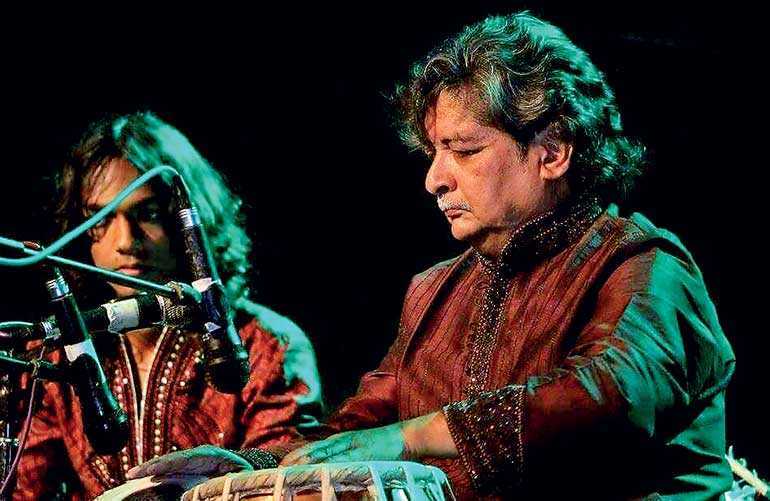 He has performed in India and in different countries like Mauritius, Singapore and Indonesia. Chinmayi is trained at the institute of Dr. Nataraja Ramakrishna under the eminent Gurus Sri Perini Kumar and Sri Kala Krishna. She has performed in many major dance festivals and programs in USA and India.